Providing a new twist on a holiday tradition, Extreme Pumpkin Carving, 2nd Edition illustrates how to carve fun three-dimensional faces and scenes in solid pumpkins (no hollowing necessary) using tools ranging from kitchen knives to carving gouges and chisels. Complete information is provided for getting started, including an overview of tools and tips for finding the best pumpkin to work with. Step-by-step instructions are detailed for using handy household tools to carve dramatic Halloween figures, and using professional tools for creating more elaborate and intricate details. Twenty frightful but fabulous pumpkin carving patterns are provided, along with full-color photographs of each finished carving. This is a great book for Halloween enthusiasts who are striving to create the best jack-o'-lantern on the block. 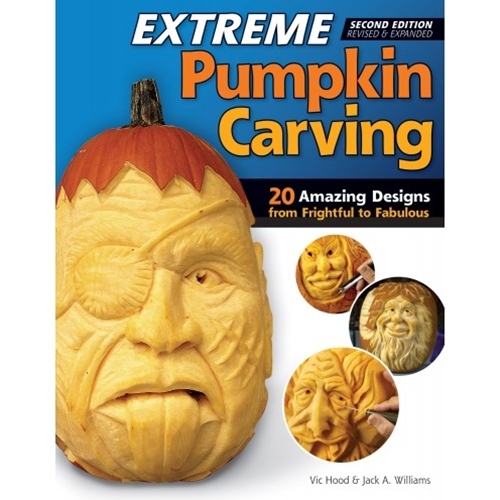 It's also a perfect book for woodcarvers who are looking for new and inexpensive ways to celebrate Halloween.